Features:	The cute knit design, soft and comfortable, very impressive and unique. They are perfect for everyday wear, photo shoots, Christmas, birthdays or any special occasion. 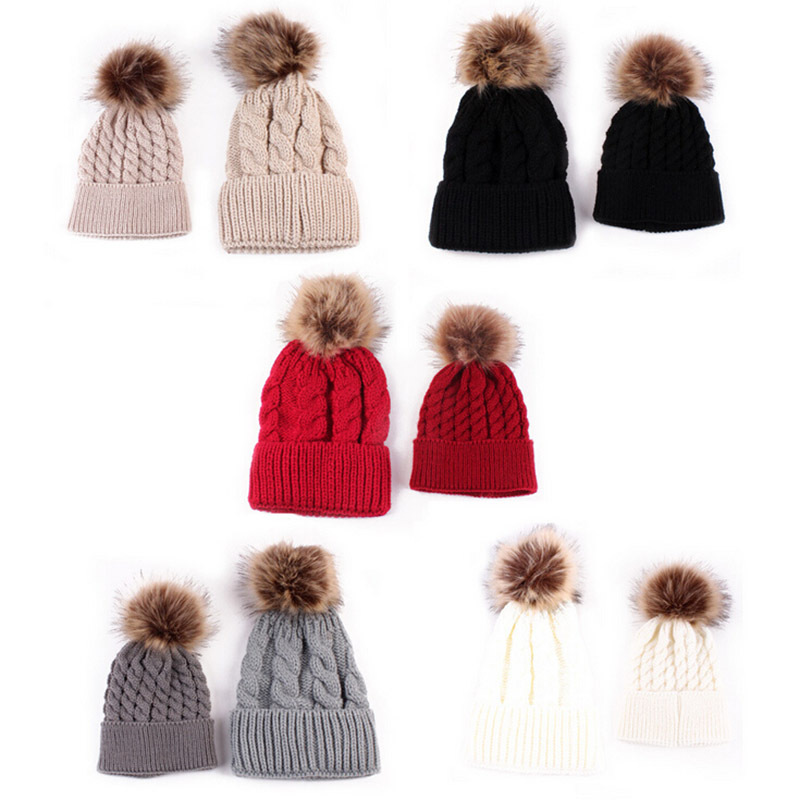 Specifications:	Material: cotton+ knit	Color: black, white, khaki, gray, red	Quantity: 1 pair (mother+ baby cap)	Adult hat size: length: 30cm , Head Circumference: About 40-65cm(Elastic)	Baby hat size: length: 23cm , Head Circumference: About 15-27cm(Elastic)	Package: 1 Pair Hats (mother+ baby cap)	Note:	1. Due to the light and screen difference, the item’s color may be slightly different from the pictures. Please understand. Make sure you don’t mind before you bid. 2. Please allow 1-3mm differences due to manual measurement	 ​Guarantee	1. If the item is defective, please notify us within 7 days after receive. Do not open dispute without communication. 2. If you are not satisfied when you receive your item, please return it within 15 days for a replacement or money back. Please contact our after service staff before return it. Payment	1. Currently, you can pay using Visa, MasterCard, Western Union, Qiwi and bank transfer. More payment options will be available on AliExpress in the future. 2. Total Cost payment includes the final auction price plus S&H(Shipping and Handling). Please note: S&H does not include duties, local taxes or any other importation fees. 3. Please list your special requests (Color, Packages, Value of Declaration, etc.) when you make payment. Orders will be processed within 24 hours of confirmed payment. Shipping	1. Worldwide shipping. We only ship to confirmed addresses. Your order address must match your shipping address. 2. Items will be checked carefully before sent out. We will leave the detailed messages of the delivery and package to you. Return Policy	1. We will endeavor to replace all broken items. 2. Please be aware that all returns must be in their original packaging. 3. Any refund amount will only cover the amount of your purchase bid and will not include any postage / packaging. 4. For your own good, please take some photos before returning to us. 5. If you are not satisfied with our products, please return the item in Unused Condition and we will refund once after we have received the item. 6. Should you have any questions, please contact us via Aliexpress message	7. Buyer is responsible for all return shipping costs. Feedback	1. We maintain high standards of excellence and strive for 100% customer satisfaction. Please kindly leave a positive feedback if you are satisfied with our products and service. 2. Any of your comments and suggestions will be highly appreciated. Please contact us immediately if you have any problem, we are always ready to answer and support. Thank you!